I used to love Kim Kardashian, I really did. I would defend her when people would say that she was famous for nothing, & all of that, but lately I have just been really disappointed in her. I don't like to talk bad of people, especially on here, & I by no means want everyone to think I am bashing her, but this is just something I've been thinking about lately that I want to get off my chest. I feel like lately Kim Kardashian has become a cartoon. I know that that is a weird way to say it, but I feel like that is the only way to describe it. I feel as though she obviously always lived a very lavish lifestyle, & was out of touch with the 'real world', but she has just grown so over the top & out of control lately that she seems like an imaginary character to me. I mean everything she does from the way she dresses to the way she acts is so exaggerated & ridiculously extravagant. I'm not sure if any of you watch Keeping Up With The Kardashians (I still happen to be a fan regardless of Kim), but even her family is fed up with her attitude. They are constantly throwing around comments about things being up to Kim's standards, & on a recent episode the majority of the scenes were focused on Kim's ridiculous behavior. It got to the point that her sister's nicknamed her 'Fancy Nancy' because she has such an uppity attitude about everything. I mean at one point she told Kourtney she wouldn't be able to sell her home because of her wallpaper choices! That is so rude! I feel like all she does anymore is post Instagram pictures of herself & all the things she has. She is so self centered that it is really out of control, & I cannot help but think that Kanye has had something to do with it. I remember watching an episode before she gave birth & her saying something along the lines of "Kanye & I each love ourselves so much that we're not sure how we're going to love another person like that." Oh my gosh who actually says something like that?! I mean these two are going to raise little North West to be an elitist to end all elitists since they are pretty close to being like that themselves. Literally all Kim is concerned about is who she is dressing North in, I mean this is a baby of a few months old, Kim is dressing her for the status & is kidding herself if she thinks otherwise. I just feel as though Kim has fallen so out of touch with the world that she is a made up character at this point. I mean it's bad when Kris Jenner says that you are getting out of control with your elitist attitude & highbrow antics. At this point I am not sure what Kim thinks this attitude is going to get her. I feel as though people are really starting to get sick of it all. Kim was always very into herself, but she has gotten to a point where she is obscenely over the top with it. It seems as though Kim does not even have fun anymore because she only cares about her image & the material things she surrounds herself with. I'm just writing this because like I said it's been on my mind. I really wish Kim would knock it off & at least attempt to become a real person again. Kim: you are pretty, & so fortunate, but you have become so egotistical that it makes me sad. I just hope that someone at some point can bring you back down to earth, or at least back within its atmosphere. 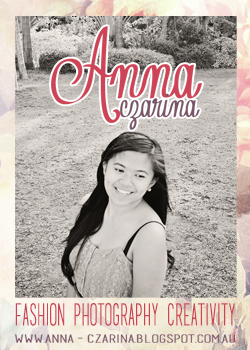 On a completely separate note I wanted to share with you one of my sponsor's from this month Anna from Anna Czarina. Anna is a total sweet heart who has an awesome blog, on which she writes posts on topics from fashion to baking (no wonder I love it so much!). To get a taste of her blog here are Anna's 5 favorite posts: Nailspiration | Marc Jacobs Stripey Lips Sugar Crystal Butterfly Banana Cake Pink Blush & Giveaways Wonderstruck by Taylor Swift The Charm Life Make sure to stop on by & give her some love! I know you will adore her blog! I agree. I love the Kardashians, I'm a huge fan of Khloe <3 but Kim is just getting worse and worse! It's definitely Kanye's influence, he's a right stuck-up guy! I'm sorry, I really can't stand any of the Kardashians, especially Kim. I've always had the hardest time with her and I agree that she's completely self absorbed and out of touch with the rest of the world. And I don't even follow their show - I refuse to! But I don't judge - my best friend loves them, haha! Anyway, I totally hear you! It's sad, really. But she has never been a good person at heart. I remember years ago, like the first season of the show, she was doing a Dress for Success event in Miami that was supposed to be hosted by her. She went out the night before and showed up hours late, stayed for 10 minutes and then left. This was a charity event that people donated thousands to hear Kim speak and to meet her. When I heard that (from a friend who was working the event for Dress for Success), I was sickened. I have no idea what is going on with her because I don't watch the show, but I don't think anyone has an ounce of respect for her. She is the epitome of "money can't buy you class." I've only ever liked Khloe and Kourtney, since she's had kids, but Kim has always been too far over the top for me. Watching KUWTK is still my guilty pleasure, but she is very out of touch with reality. Thankfully it seems like Kendall and Kylie are taking after Khloe more, but here's hoping North will take after her aunties, because her parents are the epitome of egotistical. I couldn't agree with you more, although I was never a huge fan of hers. I think the whole "image" thing started with Kanye. He is so egotistical and she is just playing in to it.